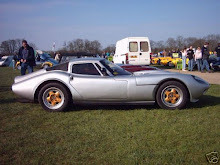 This Marcos was originally owned by John Eales from 1985-1996 and was not registered for road use originally with the DVLA as it was for track use only and John eventually passing it on to Tim H*******N who road registered it with an age related plate and was in his possession from December 1996 to October 1997. 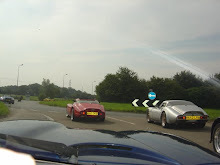 I have recently been in correspondence with Tim who whilst only owning the Marcos for a short period he certainly seemed to have plenty of fun in that time, Tim has given me permission to paste the text of a email he sent me recalling his happy times. Correct I did own the car. I bought the car direct from John Eales, minus engine and gearbox rad, fans etc. 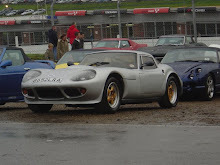 I was told that the car had had a rear end shunt into the barriers on the track and had been repaired by John, with I presume a rear section of bodywork from Marcos ( I think you will find that glass work on the rear is standard glass fibre ). I was told that the main body tub material was Carbon Kevlar weave hence the light weight (must have been cutting edge back then). Through my work we used to supply Morgan, TVR, Marcos etc with V8 engines and gearboxes, I have dealt with Rory and Marcos for many years even up to the ownership by Tony Steliga in latter years. While I had it, the chassis only needed light cosmetic work to get it serviceable as it had not been used on the road at all. I fitted the R380 gearbox that seems to be still with it, this box should take the power of your proposed engines as this is what we supplied for the LM500 track cars. I also fitted a 4.6 performance V8 (built by hand myself)using 14CUX Lucas injection, I had to cut the hole in the bonnet to get the airflow meter to fit!. This engine really made the car fly, i.e. tail out round Gerard’s at Mallory in 4th!!. Glad to see you have fitted a tamer exhaust as I got black flagged at Donnington down shifting into redgate, the marshal jumped off the wall! !, I had the original straight through 8-2-1 with a 4” rear pipe from the Y piece back!. Has it got side windows in it yet? 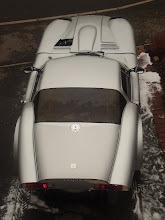 When I owned the car no provision to fit windows had been made, as it was a pure track car. Regarding the shocks, if they are the same as when I had the car they are really rather special. I did some research with the race department at Koni and I was told that they are Koni special ‘D’ this derivative was only used on the 6 wheel Tyrell formula one cars that ended up being banned. The guy from koni told me that he only new of 6 in existence and they were on the museum car. Worth looking into!!!! They would have been a fortune. I sold the car after lots of fun at Mallory, Donnington, and Thruxton, but sold the car to fund another project. I believe that Eddie had it after me, I unfortunately could not get him to buy it with the engine which was a real shame, as a lot of work had gone into it to wire it in, however sold the engine for £7000, happy days. You look like you are doing a fine job to date, and the car will be a great drive when done. On the road the ride is very stiff, but put it on the track and it comes alive. With the right engine you can feed the tail out just on the throttle, its scary but a real blast.